WASHINGTON (AP) - President Donald Trump has unloaded on the news media for using anonymous sources - just hours after members of his own staff insisted on briefing reporters only on condition their names be concealed. Unleashing a line of attack that energized an enthusiastic crowd at the nation's largest gathering of conservative activists, Trump said Friday that unethical reporters "make up stories and make up sources." "They shouldn't be allowed to use sources unless they use somebody's name," he declared. "Let their name be put out there." Trump told the Conservative Political Action Conference that while not all reporters are bad, the "fake news" crowd "doesn't represent the people. It will never represent the people and we're going to do something about it." Trump didn't expand on what he had in mind or which news organizations he was talking about. But his broadsides represented an escalation of his running battle against the press, which he has taken to calling "the opposition party." The president has chafed at a number of anonymously sourced stories, including numerous reports describing contacts between his campaign advisers and Russian intelligence agents, which the White House has sharply disputed. However, members of his White House team regularly demand anonymity when talking to reporters. That was the case Friday morning when Trump officials briefed reporters on chief of staff Reince Priebus' contact with top FBI officials concerning the Russia reports. Later Friday, after Trump's speech, several news organizations including The New York Times, The Los Angeles Times, CNN and Politico were blocked from joining a White House media gaggle, according to news reports. The Associated Press chose not to participate following the move by White House press secretary Sean Spicer. Lauren Easton, the AP's director of media relations, said in a statement: "The AP believes the public should have as much access to the president as possible." Trump's appearance at CPAC represented a triumph for both speaker and audience - each ascendant after years when they were far from the center of the political universe. Elizabeth Connors of New York recalled past gatherings as collections of the "downtrodden." Today, she said, "it's energized" after years in which "we've been just pushed down, pushed down, pushed down." Nicholas Henderson of Coeur d'Alene, Idaho, was there in his "Make America Great Again" hat and pronounced Trump's speech rousing. "He touched on a lot of things we'd already heard before, which is reassuring, tells us he's still committed to those promises he made during the campaign," Henderson said. Trump, who first appeared at CPAC as a reality TV star six years ago, recalled his past visits with nostalgia, saying the crowd helped put him on the path to the presidency. "I loved the commotion," he said. "And then they did these polls where I went through the roof and I wasn't even running, right? But it gave me an idea." From there, Trump's latest speech played out like a greatest hits reel from his 2016 campaign. He reminisced about his victory in the Republican primaries. He vowed to "build the wall" along the Mexican border. He denounced Hillary Clinton's characterization of some of his supporters as belonging in a "basket of deplorables." The crowd responded to his Clinton criticism with chants of "Lock her up!" just as they did at Trump rallies last year. Further blurring the line between candidate and president, Trump departed the stage to the Rolling Stones' "You Can't Always Get What You Want," the same exit music he used during his campaign. As for Trump's criticism of anonymous sources, Gregg Leslie, legal defense director for the Reporters Committee for Freedom of the Press, said such arrangements are "essential to good reporting" in many cases. "There are just some things that people will come forward about anonymously that they cannot discuss openly," Leslie said, citing potential threats to jobs and even personal safety. The Associated Press uses anonymous sources only if the material is factual information, not opinion or speculation, and is vital to the news report. It must come from a person who is reliable and in a position to have accurate information. Long ago, Trump himself played fast and loose with sourcing. In the 1990s, when his personal life was tabloid fodder, a "spokesman" who identified himself as John Miller, would call to offer details about the businessman's failing marriage and the girlfriends he was juggling. But The Washington Post reported it was actually Trump, posing as his own publicist. In later years Trump denied it, but he had owned up to it at the time, describing the Miller calls as a "joke gone awry," according to the Post. All presidents have their moments of tension with the press, but Trump's first weeks in office have brought a frontal attack unlike anything from any other president. 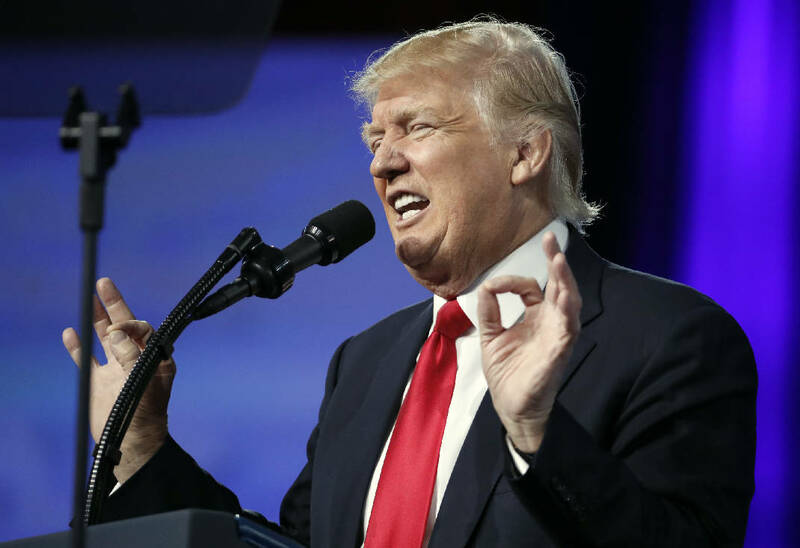 After his newest jibes, Trump turned his CPAC speech into a recitation of his top agenda items, promising bold action on health care, trade, immigration, energy and more. "One by one, we're checking off the promises we made to the American people," he said, telling the group, "I will not disappoint you." He told the conservatives the health care law he inherited from President Barack Obama threatens to bring about "total catastrophe," reiterating his promise to repeal and replace it. On illegal immigration, he said that "as we speak today, immigration officers are finding gang members, drug dealers and criminal aliens and throwing them the hell out." He promised changes to the welfare system, saying, "It's time for all Americans to get off welfare and get back to work," adding that: "You're going to love it." Associated Press writers Jonathan Lemire and Julie Bykowicz contributed to this report.